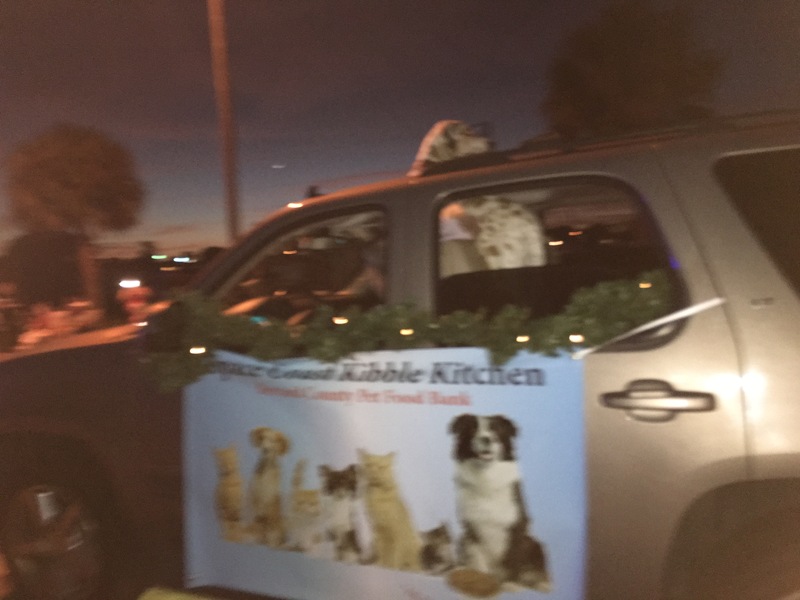 Space Coast Kibble Kitchen’s float (ok our President’s car) at the Melbourne Light Parade on Saturday, December 12, 2015. Space Coast Kibble Kitchen is Brevard County’s 501c3 Pet Food Bank. All along the parade route, spectators offered up bags and cans of pet food to help us provide pet food to less fortunate families in Brevard County, Florida. Thanks to all the volunteers who showed up to walk the parade with us and also thank you to our mascot Randy (Great Dane that walks by with a red bow on)! A special thank you to the folks at Melbourne Light Parade for including SCKK in the parade but also for providing us with the pet food donated by spectators. SCKK’s mascot, Randy (Great Dane), sticking his head out of the sunroof of a Tahoe!